Aerial refuelling photos are always awesome. But this one, taken right after two of America’s best ground attack jets were topped up, easily beats all the similar photos I’ve ever seen. 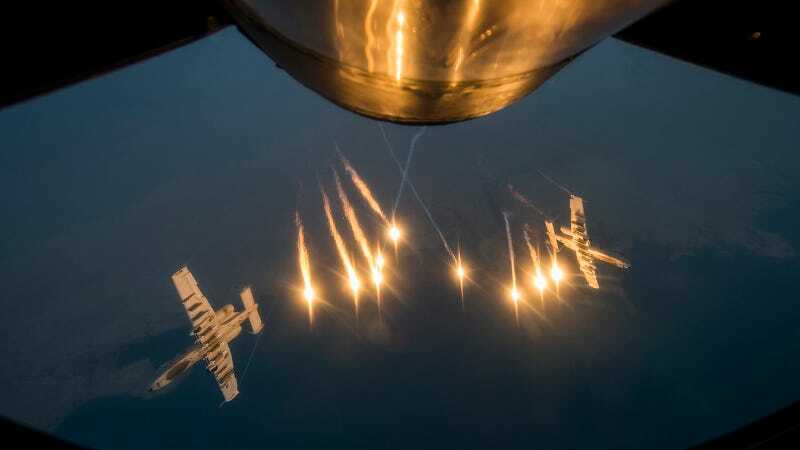 Two U.S. Air Force A-10 Warthogs, assigned to the 163rd Expeditionary Fighter Squadron, release flares after receiving fuel from a KC-135 Stratotanker, 340th Expeditionary Aerial Refueling Squadron, over Southwest Asia, Oct. 13, 2015. Coalition forces fly daily missions in support of Operation Inherent Resolve.